Although eggplant and bell peppers are technically summer vegetables, they continue to appear on my table all through the early weeks of fall. I may even like them better in the fall. During the late summer I am so busy consuming my fill of corn and tomatoes and summer squash that these rich jewels of late summer are sometimes pushed to the side. But when the weather begins to turn cool…and the light begins to fade before we sit down to eat…I am really in the mood for the savory and substantial gratins, tarts, pastas, ragouts and stews in which these two really shine. The recipe I’m sharing today is a perfect example of this. It has more substance than the things I am likely to prepare on a warm summer day—but it is perfect for a cool evening. Furthermore, as a person who is very attached to the light, it is cheering to be able to serve these vibrant fruits of summer during the rapidly fading light of an early fall evening. The other recipe is for a spiced freekeh pilaf. I have posted several freekeh pilafs in the past and this is only slightly altered from those. The first time I made this dish I spiced my pilaf with cinnamon and cumin. The second time, I was measuring out the cinnamon when all of a sudden it occurred to me that fennel seed would be delicious instead of cinnamon. I preferred the fennel…but you should use whichever you like best. 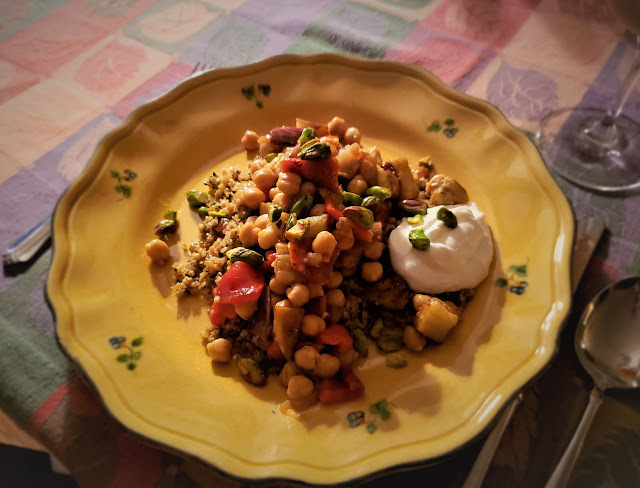 If you don’t have any freekeh…or don’t like it…simply substitute medium bulgur. Bulgur only takes 15 to 20 minutes to cook (rather than 20 to 25), so adjust the recipe accordingly. You could also simply serve the medley of vegetables on a mound of plain couscous. This moment when the time is right for hearty eggplant and pepper preparations is short. In a couple of weeks I know I will be totally ready for winter squash…and root vegetables…and rich, meat stews and braises. But for now, dishes like this one are the perfect way for me to ease into the new season without quite letting go of the one that came before. Roast the bell peppers: Preheat the broiler to high. Rub the peppers with a thin film of olive oil and place on a baking sheet. Slide the peppers under the broiler, allowing them to char before rotating to expose all sides to the heat of the broiler. When the skin is blackened and blistered all over, remove from the oven and set aside until cool enough to handle. Adjust the oven rack to the middle position and set the oven to 450°. While the peppers roast, place the lemon juice, garlic and cayenne in a large bowl. Whisk to break up the garlic. Whisk 2 T. olive oil into the lemon mixture. Add the chickpeas and toss to coat. Peel and seed the peppers and cut into a rough 1-inch dice. Add the peppers to the chickpeas, folding to distribute. Taste and correct the seasoning with salt. Meanwhile, toss the eggplant in a generous amount of olive oil (about 3 T.) and season with salt & pepper. Transfer the eggplant to a rimmed baking sheet that has been lightly sprayed with pan spray. Roast in the preheated oven, rotating the pan from front to back half way through the cooking time. If you like, "stir" the eggplant once as it cooks by turning it over with a pancake turner. The eggplant is done when it is golden and tender—about 25 minutes. When the eggplant is done cooking, remove from the oven and reduce the oven temperature to 350°. Let the eggplant cool on the sheet for few minutes. While it is still hot, add it to the bowl with the chickpeas and peppers and fold in. Taste and correct the seasoning with salt, cayenne pepper and lemon juice. While the peppers and eggplant roast, cook the freekeh. Warm 3 T. or so of olive oil in a heavy-bottomed pot set over medium heat. Add the onions and stir to coat in the fat. Sweat, stirring occasionally, until the onion is soft and translucent and just beginning to take on a bit of color at the edges—about 10 to 15 minutes. Increase the heat to medium high and add the drained freekeh along with the spices and a generous pinch of salt. Continue to cook for a minute or so until the grains are coated in the oil and sizzling in the hot oil. Add the water and bring to a full boil. Reduce the heat to the lowest setting and cook, covered until the freekeh is tender—20 to 25 minutes. Remove from the heat and scatter the golden raisins over the surface of the freekeh. Cover and let rest for 5 minutes. Add the herbs and fluff with a fork. Taste and correct the seasoning. While the freekeh cooks, spread pistachios on a baking sheet and lightly toast in a 350­° oven until fragrant and tinged with a bit of color. Don’t overdo it—you want the nuts to remain bright green. Cool, chop coarsely and drizzle with a small amount of oil. Season with salt. To serve, mound the freekeh on individual plates or on a large platter. 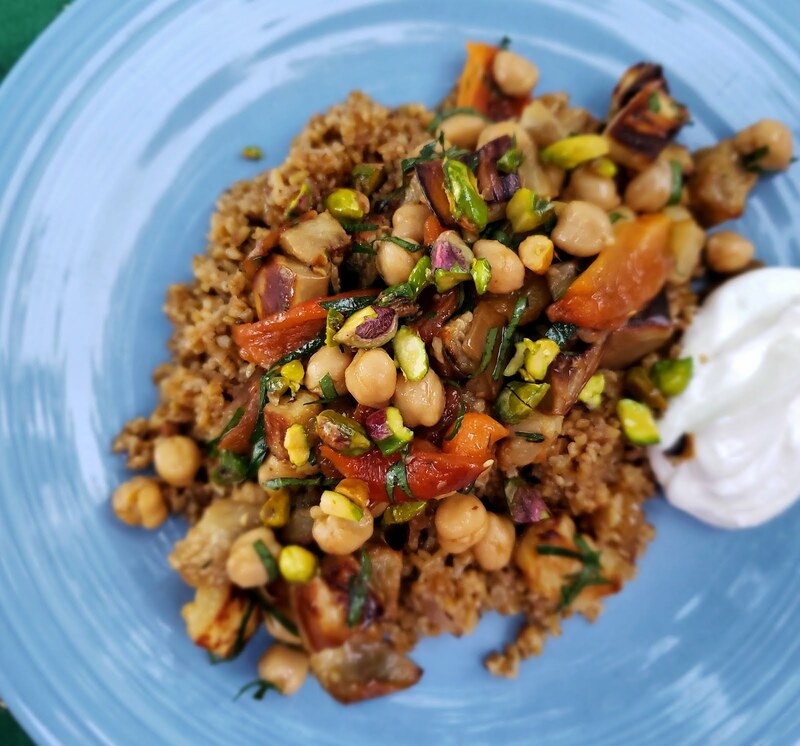 Spoon the roasted vegetables over the freekeh and scatter the toasted pistachios over all. Pass strained yogurt or labneh separately. Serves 4 to 5. Substitute ground cinnamon for the fennel seed in the pilaf. Scatter crumbled Feta over the finished dish instead of passing labneh on the side. 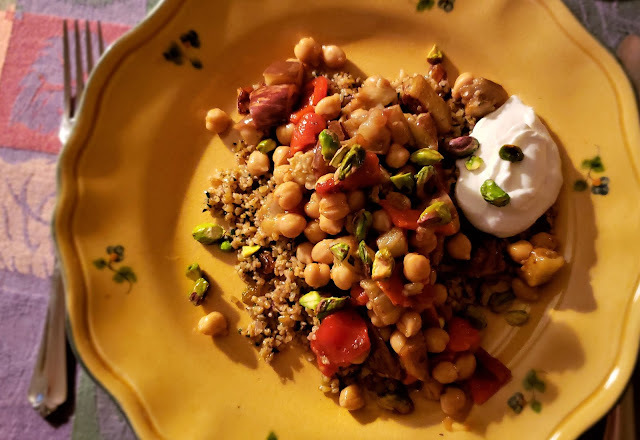 Substitute Bulgur for Freekeh. Cook for 15 to 20 minutes. Use 1 2/3 c. water.